Climb That Mountain: Why Make? A new member joined our team a couple of weeks ago, and as we took him out for a cup of coffee on his first week, he asked me a question: "I’ve never seen this before and I wanted to ask you. 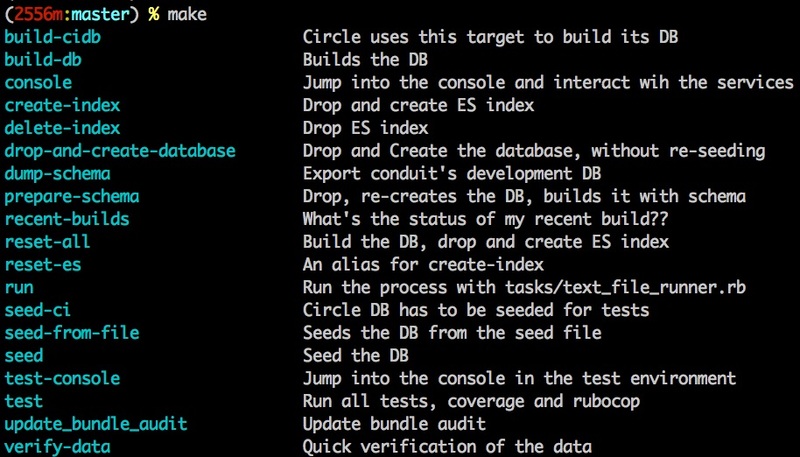 Why are you using Make in your Ruby project?" His question was legit coming from someone in the Ruby world, where we have rake for achieving the same goal. I had to think about the history there as I explained my reasoning behind using it. As I started looking at other programming languages, rake wasn’t available for me. 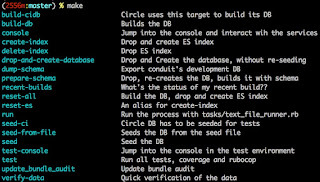 A couple of years ago I got pretty deep into node.js, and there were repetitive tasks I had to do, like dropping and rebuilding a database, running the tests, etc. I created a script directory and put separate scripts in it to accomplish all that. This worked OK for a while, but when I contributed to the great testing framework mocha.js, I realized that the author of that module, T.J., just took these convenience scripts to another level by using Make. I noticed he is using Make to run simple shell commands in a more elegant manner than I did with my scripts directory and shell scripts in it. I immediately started to adopt this practice. As I started exploring other languages like Clojure, Erlang, Haskell, using Make was an obvious choice. It did not matter what language I used, dropping and building a database was the same task, regardless. This practice came with me as I went back to Ruby as well. As I started working on larger, 3-4-year-old Rails apps, running rake tasks was a time-consuming exercise. Bundler had to load the whole world into memory before it could even evaluate what it had to do. This way, simple tasks that had nothing to do with Rails had an 8-10 seconds startup time. I did not think twice about firing up a Makefile to do the same in less than a second. Of course, some of the religious Rails disciples dismissed this, but productivity over religion has a higher precedence for me. Now, I only need to type make-init in the terminal and I have a Makefile to work with.